Quezon City Bargain ! 30 sqm P1.2M Won't Last ! Here is a 30 sqm upgraded condominium unit at Spazio Bernardo by Phinma Properties. 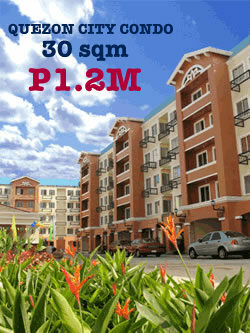 At 40,000/ sqm – this is a great investment for only P1.2M. This is only available for sale on a cash basis. Please call 9948103 or 09228225798 for serious inquiry. Beautiful Lady Owner got married and would be living in a much much bigger house.